I won’t lie, the biggest reason behind our downsize was because I got so sick of cleaning a big house. See the full story on our family’s downsize. When we moved into our smaller home I was determined to make this house feel like a home in every possible way. Because I feel better in a clean, crisp, clutter free environment, that meant doing my best to make sure my home was well maintained at all times. Like any flawed human beings I’m not always perfect at this, but I have created 5 really simple habits that help keep a clean house every day and I want to share them with you. Simple Habit #1: Make your bed. Remember that thing your parents always told you to do and you never listened?! Turns out they were on to something. Getting your day started by making your bed is a great and very simple way to set yourself up for success for the rest of the day! No matter what happens, no matter what goes wrong, you will always have one thing that you did right. You made your bed. I can’t tell you how satisfying it is to walk into my room at the end of the day and see a clean, white, well made bed. Then again, I do take joy in the simple things. Simple Habit #2: Use your hamper. A funny thing happens right after you make your bed. You start picking up other things that you see lying around. Let your clothes be one of those things that you pick up. Doing this will only help you maintain your clean house every day. No matter what solution works for you, stick to it. Making a habit of cleaning up clothes before they hit the floor is a great way to make sure you’re not left with a heaping mess at the end of the week. Simple Habit #3: Shift the dishes. Nothing makes me feel more defeated then a messy sink filled with dishes. During our downsize we actually wound up staying with my in-laws for three weeks! While we were their house guests I made sure to wash each dish as soon as I was done using it. You know what I realized after this? It is amazing. While I don’t immediately wash each dish after using it, I do take a moment to rinse it off and put it in the dish washer. Doing this helps keep counters and sinks clear which is a huge relief at the end of a long day. Simple Habit #4: Clear the counters. Again, as you clear the sink, chances are you’ll notice the counters. My simple solution to this problem is to make sure the counters are cleared off at the end of every night. I holler like a crazy person for the kids to come get anything they have left out. The best way to ensure that you counters remain clutter free at the end of the night is to create a convenient “command station.” Some people will dedicate an entire wall to this. I personally choose to use a magazine holder to store all of our upcoming bills and important papers. Keeping everything out of sight and out of mind not only get you a little more organized but helps you maintain that clean house every day. 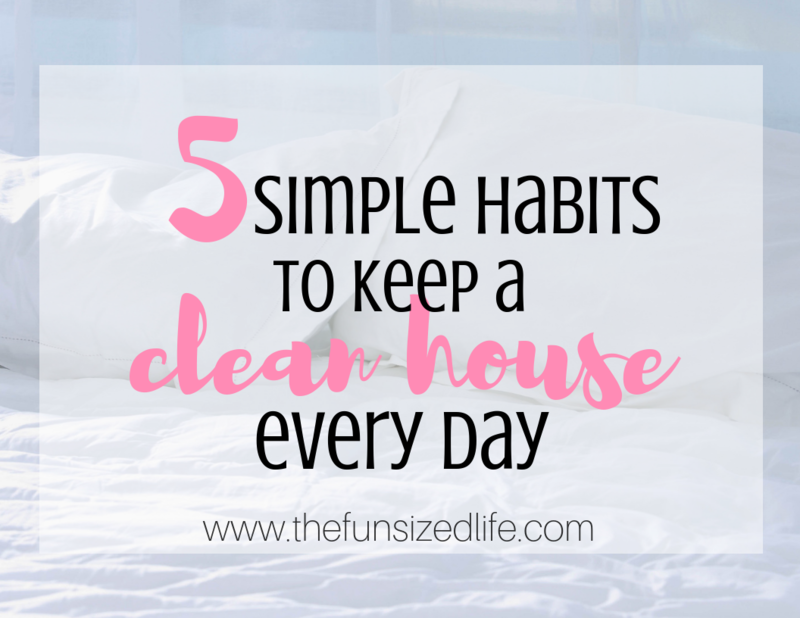 Simple Habit #5: Clean house. I know, this sounds like what we’ve been doing the entire time. I’m not talking hands and knees scrubbing floors and toilets kind of cleaning. Although that’s important too. What I mean is, get rid of your stuff! If you are finding ways to organize a house full of clutter but not actually clearing any of it away, chances are you will continue to live in chaos. Luckily, I have gathered multiple different ways to begin to downsize your clutter. Pick one or two of these habits to stick with, and slowly you will start to a clean house seems more and more doable. I suggest starting with your bed. It’s an easy, mindless task to do first thing in the morning and it tends to have that ripple effect. It’s amazing what a simple made bed can do to your happiness and energy levels first thing in the morning. Starting a day out with a state of peace and accomplishment (no matter how small) can only lead to better things throughout your day. Continue to add to the rolling stone and keep gathering that moss. Before you know it, you have a house that is easier to manage and requires much less time to clean up when you have last minute company knocking at the door.